Antique c1900s quilt, purchased in South Carolina. The quilt measures about 90" x 90". There are 9 25" x 25" hand applique blocks, set straight with a triple strip sashing measuring 3" wide, and a 4.5" wide green border. 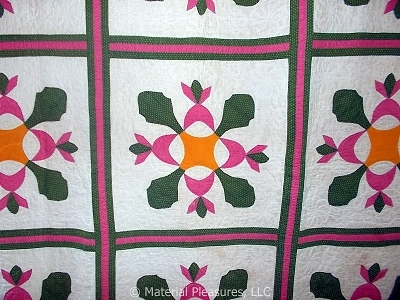 The pattern is an Oak Leaf and Reel Variation in pink, green, and that wonderful cheddar orange solid in the center! It is all hand pieced, hand appliqued, and hand quilted. The quilting designs include flowers, stars, ovals, and leaves in the ground space, to the piece in the applique and sashing, and triple parallel lines on the diagonal in the border. Binding is 3/8" wide applied pink print like in the applique. Backing is a white cotton solid. In very good condition, some small spots and overall toning, that does not detract from the quilt. It is still very bright. One corner looks like it was damaged and repaired, please see the pictures. A few small holes in the binding. Please contact me if you would like additional pictures.